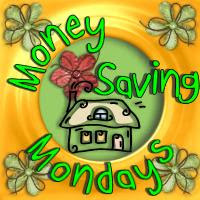 My Little Patch of Sunshine: Money Saving Monday #30 - Energy! Saving energy is good for your pocketbook, as well as the environment. It's never a good idea to waste energy, but most people choose to conserve energy in order to save money. That's okay -- because those efforts that save money also help conserve energy being used. We all have chargers around the house for our various portable devices. How often do you unplug those chargers? I make a conscious effort to unplug ours, but I'm the only one in the house that does so. Some people think that it is such a small amount of energy that it can't make much difference, but all those small amounts can add up to a large amount over time -- especially when considering multiple chargers! Did you know that in the US alone, $10 billion is wasted by power being wasted by devices on standby? Chargers are not the only culprits of standby power -- computers, televisions, stereo equipment, home entertainment equipment, kitchen appliances -- even though they are turned off they can still pull a little power from the outlet. The best way to stop that is to unplug the device from the wall when not in use, or use power strips and be sure to turn the power strip off when the devices are not being used. If you have kids, the Department of Energy has a great site to help you share information with your kids about saving energy and different ways they can help. While parents have to be good role models, sites like this can provide great information in simple ways to help them get on board with saving energy. Lydia especially likes Tinkerbell on that site! I ordered a Kill A Watt Electricity Usage Monitor so that we can see exactly how much energy plugged in devices in our home use, even when turned off. As soon as it arrives, I'll be updating you with what I've found out! I'm hoping that my family will be more willing to unplug things once they see actual numbers of how much power is being wasted. I am also looking into using chargers that actually stop pulling power when they've charged the device, and can't wait to see how they compare to traditional chargers. There is much we can do to conserve energy, but I believe in making many small changes over time, which will add up to one large difference. Our first step is to reduce vampire power drainage from our home! What are you doing to conserve energy?